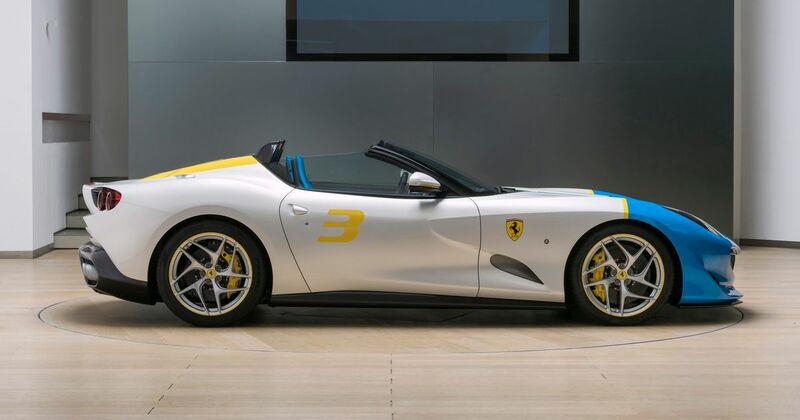 Ferrari is gorging itself on ultra-special one-off projects, lately, and this is the newest. It’s called the SP3JC, and it’s quite distinctive. The roofless product of dreams and nostalgia was commissioned by an exceptionally wealthy Ferrari customer and collector as an homage to Ferrari’s 1950s and 1960s V12-engined spiders. Based on the limited edition F12tdf, the SP took over two years of work to complete. Imagine the final invoice, if you dare. We love the two glass inserts in the bonnet that show-off the glorious 769bhp V12 beneath. We’re equally fond of the brushed aluminium external fuel cap, which is a clear retro nod to those cars that inspired the SP. Extra bodywork sculpting around the sides is designed to emphasise that long nose in conjunction with the new ‘air intake outline,’ by which Ferrari means it’s not actually a real hole. 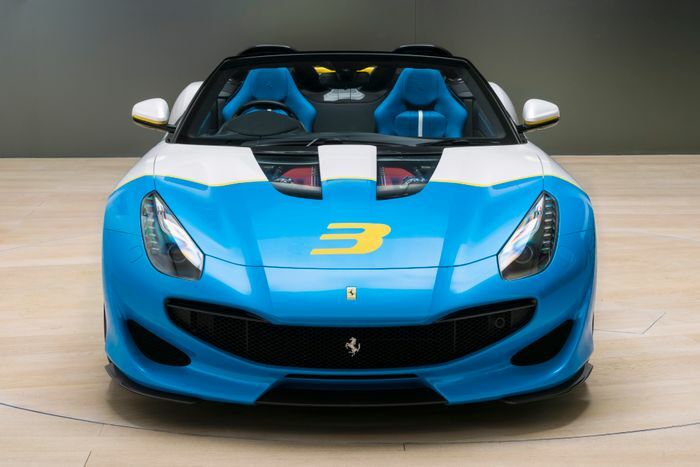 The client is said to have a passion for pop art, which inspired the stark blue and white paint job accented by yellow racing numbers in a vaguely model car-ish way. It’s like the Scalextric car you always dreamed of. 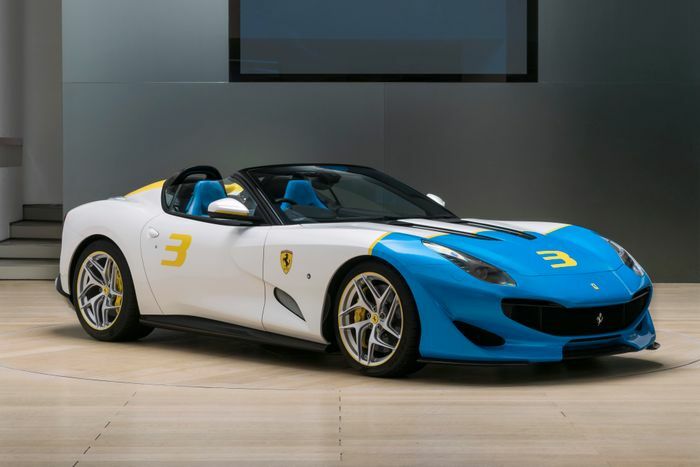 If you’re interested, those colours are Azzuro Met (metallic light blue) and Giallo Modena (Modena yellow) over Bianco Italia (Italy White). 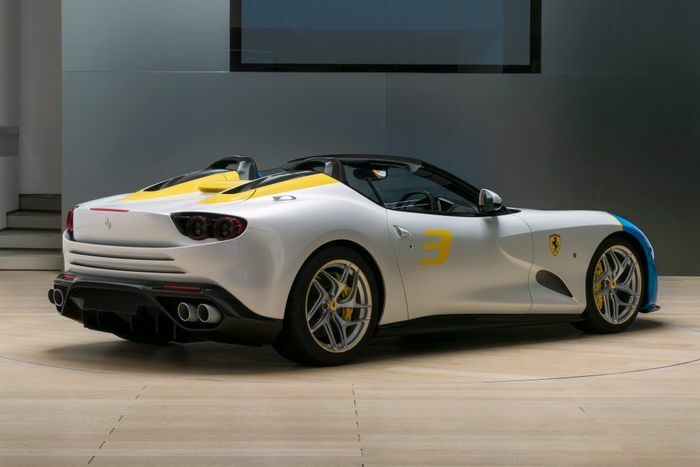 Together, says Ferrari, they enhance the SP’s “sensual volumes.” Oo-err. The interior trim follows the same colour scheme. Blue leather seats feature white inserts while the blue extends both to the lower dashboard and to contrasting stitching elsewhere in the layout. Will it ever be driven? We sincerely hope so.